Creative 360 has added something new to their Express Yourself Artshop offerings – Mask Making. Creating a mask is a way for people to express feelings that are too difficult to articulate in words. The activity is especially helpful for those dealing with traumatic brain injury (TMI) OR PTSD. The first workshop is scheduled for Friday and Saturday, February 8 and 9, from 6:00 to 8:00 p.m. Cost is $40 + $15 for materials. Contact Creative 360 at 989-837-1885 or online at becreative360.org to register. Participants will create a thermal plastic mask from scratch while exploring sculpting and finishing techniques. All materials are provided, but you are welcome to bring in special decorative objects or materials from home if you wish to add texture, dimension and personalization. Everyone will take home a mask to be worn or displayed as an art piece. The Mask Making Creative Workshop is led by Veteran Gene Miller. Gene has experienced the healing power of mask-making for Veterans, and that was his original focus. 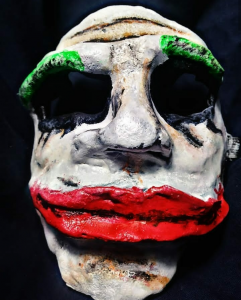 After further consideration, Gene realized there are many people who would benefit from mask-making, so he opened his workshop to anyone in the community who would like the experience. The healing nature of doing creative things like drawing, painting, collage, coloring, or sculpting is widely known. Creativity provides an outlet to express feelings and emotions that are too difficult to express in words. Creative 360 staff has witnessed first-hand the positive effects of creative expression. Whether doing art, dancing, singing, acting or working out, students often blossom and become happier before your eyes! There is an excellent National Geographic online article written by Caroline Alexander that focuses on the healing effects of these masks on veterans at https://www.nationalgeographic.com/healing-soldiers. The article offers examples of the masks and the stories of the soldiers who created them.